Cimber (centre) holds out the petition and pulls at Caesar's tunic, while Casca behind prepares to strike: painting by Karl von Piloty. Publius Servilius Casca Longus (84 BC – c. 42 BC) was one of the assassins of Gaius Julius Caesar. 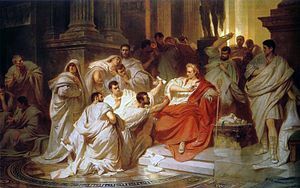 He and several other senators conspired to kill him, a plan which they carried out on 15 March, 44 BC. Afterwards, Casca fought with the liberators during the Liberators' civil war. He is believed to have died by suicide after their defeat at the Battle of Philippi in 42 B.C. Despite his family being loyal to Caesar, with Casca's brother Titiedius Servilius Casca even being a close friend of Caesar's, both siblings joined in the assassination. Casca struck the first blow, attacking Caesar from behind and hitting his neck, after Tillius Cimber had distracted the dictator by grabbing his toga. The other assassins then joined in. At the time Casca held the office of Tribune of the Plebs. After the assassination he fled Rome, and his colleague in the tribunate, P. Titius, had him deprived of his office. Casca joined Marcus Junius Brutus and Gaius Cassius Longinus, the leaders of the assassins, during the Liberators' civil war against the Second Triumvirate, Caesar's former supporters. He seems to have died, probably by suicide, in the aftermath of their defeat at the Battle of Philippi, in October 42 B.C. Casca is commemorated on a coin along with Brutus, in which a bearded figure is depicted next to his name. However, this appears to be the god Neptune rather than a portrait of Casca. "See what a rent the envious Casca made". The two words became the title of a mystery novel by Georgette Heyer. In the 1937–38 Mercury Theatre stage production Caesar, Publius was played by Joseph Cotten. In the 1953 film of Shakespeare's Julius Caesar, Casca is portrayed by Edmond O'Brien. In the 1963 film Cleopatra, Casca is portrayed by Carroll O'Connor. In the 1970 film of Shakespeare's Julius Caesar, Casca is portrayed by Robert Vaughn. In the 1999 miniseries Cleopatra, Casca is portrayed by David Schofield. In the TV series Rome (2005–07), Servilius Casca is portrayed by Peter Gevisser. Wikisource has the text of a 1905 New International Encyclopedia article about Servilius Casca. This page was last edited on 31 March 2019, at 23:05 (UTC).